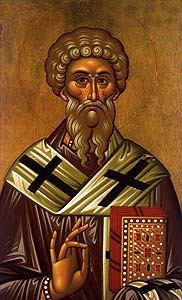 St Blasios was born in Cappadocia during the 3rd century AD. He was meek and God-fearing from childhood, and was chosen for his virtues as Bishop of Sebaste. He was a great spiritual and moral light in that pagan town during a period of violent persecution of Christians, who healed the diseases of both humans and beasts, and especially infants. St. Blasios encouraged his flock and visited Christians in prison, amongst whom was St Eustratios. Later St Blasios collected St Eustratios' relics and executed his last will and testament. When Sebaste was left denuded of Christians, after some were killed and others fled, St Blasios went to the mountains of Argeos and lived there in a cave. Ferocious beasts would come to him to feed him as he cared for them like a human flock. The Roman persecutors eventually found the Saint and as they were taking him away to be judged he healed a boy who had a fishbone stuck in his throat. The cruel judges had the Saint tortured and flogged. While he was being tortured, his steadfastness in the Christian faith brought many unbelievers to the faith. Seven women and two children were thrown into prison with him. The women were slain first, and then Blasios and the two children were beheaded in c. 316 AD at the order of Agricolaus, prefect of Armenia under Emperor Licinius. As a sharer of the ways and a successor to the throne of the Apostles, O inspired of God, thou foundest discipline to be a means of ascent to divine vision. Wherefore, having rightly divided the word of truth, thou didst also contest for the Faith even unto blood, O Hieromartyr Blasios. Intercede with Christ our God that our souls be saved. O Unfading bloom, thou Godly shoot and fruitful branch of Christ God the Vine, O holy and God-bearing Blasios, do thou fill with thy joy them that with faith observe thy memorial; and unceasingly intercede with Christ our Redeemer that we all be saved.